The School of Art at Montana State University is pleased to announce the opening of the 2018 Fall BFA Thesis Exhibition at the Helen E. Copeland located on the second floor of the School of Art in Haynes Hall, Bozeman MT. The show will be on Monday, December 9th – Friday, December 14th, 2018. The public reception is Friday, December 14th from 6:00-8:00 p.m. and will be free and open to the public. Hors d’oeuvres will be served, as will a cash bar. On view will be the thesis works of six emerging artists graduating with their Bachelors Degrees in Fine Art. A number of disciplines will be represented: drawing, painting, printmaking, and ceramics. For BFA graduates, the thesis exhibition represents an important transition period from student to working artist. It marks an end to academically assigned work, and the beginning of their individual research and artistic maturity. The exhibited works synthesize the growth of each artist over their years spent at MSU. Showcasing some of the finest that the MSU School of Art has to offer, the exhibition will include Hilary Honadel, Cameron Koch, Hunter Gillingham, Jake Mayo, Robyn Till, and Elise Perpignano. The Helen E. Copeland Gallery is located on the second floor of Haynes Hall. Please note that the parking passes are required for parking during the business day (6AM – 6PM). For more information on this exhibition, or on the Helen E. Copeland Gallery in general, please visit http://hecgallery.com or follow us on Facebook (http://facebook.com/msuhecg). The School of Art at Montana State University is pleased to announce the opening of The Face of the River: Sabbatical Exhibition by Gesine Janzen at the Helen E. Copeland Gallery located on the second floor of the School of Art in Haynes Hall, Bozeman, MT. The show will be on exhibit Tuesday, November 6th – Friday, November 16th. A reception will be held on Thursday, November 8th, 6:00 – 8:00 pm and will be free and open to the public. Hors d’oeuvres will be served. During her sabbatical between 2017 and 2018, Bozeman artist and MSU School of Art Printmaking professor, Gesine Janzen traveled across Wyoming, Montana, Colorado, Utah, and Arizona to study all forms of natural and man-made water formations: lakes, reservoirs, rivers and streams, dams, levees, and empty creek beds to name a few. Using woodblock prints and ink paintings, Janzen captures the direction, power, speed, and immensity of water in this part of the country. Born in Kansas in 1967, Janzen received her Bachelor of Arts degree at Bethel College in her home state. She also has B.F.A in Printmaking from the University of Kansas and an M.F.A from the University of Iowa in Printmaking and Drawing. Janzen joined Montana State University in 2002, and has used her time in Montana to further develop her style, teaching the practice of fine art printing to the next generation of artists. The HECG is located on the second floor of Haynes Hall, across from the Aasheim Gate off of 11th, with the Ski Swing out front. Please note that the parking passes are required for parking during the business day (6AM – 6PM). Gallery Hours: Monday – Friday, 9AM – 5PM/Closed on weekends. The School of Art at Montana State University is pleased to announce MSU School of Art International Artist-in-Residence: Cheon Pyo Lee at the Helen E. Copeland located on the second floor of Haynes Hall, Bozeman MT. Lee will lecture on his work in the gallery on Tuesday, October 30th from 4:30 -5:30 with time for questions afterwards. The public reception will follow immediately afterwards from 6:00-8:00 p.m. The reception is free and open to the public. Hors d’oeuvres will be served. Cheon Pyo Lee is a New York-based artist whose multidisciplinary practice is grounded in notions of absurdity, play, and experimentation. At the heart of Lee’s work is a mischievous but resolute desire to subvert systemic notions of value and authenticity through personal encounters and experiences. Definitely a departure from the normal Bozeman fare, this is not an exhibition to be missed. There is a lot of pressure to create a full exhibition in the HECG in one month’s time, but the local area always prove to be inspiring– too inspiring if anything. It can be hard to nail down a focus with so many possibilities for subject matter. Every iAiR that comes to MSU takes something different from the Montana experience, placing what is unique about the state in a new, fresh, contemporary light, bringing something to the Bozeman art scene that is unique, with an outsider perspective on what we consider standard Montana ways of life. Whereas past artists have focused on landscapes and horses, in his time in Montana, Lee has gone tracking and hunting with locals which has been the main focus of his piece in the gallery. He has become enamored with the art of hunting and field dressing, likening it to a dance. Lee’s installation will include video projections and short films made during his time here, ceramic pieces organized like Dutch still-lifes created by Lee and ceramic students, and smaller pieces and installations. There will also be discussions about his latest book, Alibi of Autonomy, two stories that were written by fellow artists, based on photographs and receipts from Lee’s residencies in Wales and Basel. In Lee’s perspective, the artist who doesn’t produce primarily for the market, the artist who wants to maintain a certain autonomy in his or her artistic production, is dependent on ‘residencies’ in order to produce new work. Residence is also an obligation to move to another place. In this sense, the artist-in-residence is in the first place a migrant in order to be able to become an artist-in-residence. Embracing the fate of a migrant as a new mode of artistic production Lee presents works produced or collaborated during his residencies, and travels. The exhibition in the Helen E. Copeland Gallery is part video screening, part installation through which Lee constructs a fragmented narrative based on samples collected during his temporary residence in Bozeman, MT. Though born in 1980 in Korea, Cheon Pyo Lee spent his formative years in Paraguay. Lee lives and works in Brooklyn, NY with his wife who is also an artist, and has an MFA from the Yale University School of Art, and a BFA from the Art institute of Chicago. As world travelers, Lee and his companion have traveled far and wide, creating art that is site-specific and locally inspired. Originally trained as a painter, Lee has expanded into installation art. Lee has exhibited internationally including in Texas, San Jose, Cincinnati, Brazil; and throughout New York City and Seoul, Korea. For more information on Cheon Pyo Lee and his work, please visit www.cargocollective.com/cheonpyolee. The Helen E. Copeland Gallery is located on the second floor of Haynes Hall. Please note that the parking passes are required for parking during the business day (6AM-6PM).For more information on this exhibition, or on the Helen E. Copeland Gallery in general, please visit https://hecgallery.com or follow us on Facebook (http://facebook.com/msuhecg.) For more information, please email the Gallery Director, Ella Watson at ella.watson@montana.edu or call the School of Arts at (406) 994-4501. The School of Art at Montana State University is pleased to announce the opening of a multi-part woodfire ceramics celebration, Upstream of the Confluence, occurring Monday, October 1st – Thursday, October 25th. In conjunction with the “Cultural Confluence,” an international woodfire symposium in Helena on October 18th – 20th, the event at Montana State University will extend the celebration of woodfire traditions to Bozeman, highlighting the evolution and convergence of woodfire practices in creation of the contemporary. The celebration will take place across campus including the Helen E. Copeland Gallery, the Waller-Yoblonsky Gallery, the Exit Gallery, and the Beyond Gallery (a new pop-up space that will be on display outside of the Waller-Yoblonsky the evening of Tuesday, October 16th). Each gallery will be showcasing unique collections of woodfired ceramics created by Montana State students, alumni or staff, ranging in date from 1945 to present. The Helen E. Copeland Gallery exhibition, East Fork, curated by Ella Watson, Josh DeWeese, and Dean Adams, will display alumni and faculty work including include Rudy Autio, Peter Voulkos, professor emeritus Frances Senska, professors Dean Adams and Josh DeWeese, as well as former students Rachael Marne Jones, Kelsie Rudolph, Danielle O’Malley, Mark Kronfuss, Boomer Moore, Mat Rude and many more from Monday, October 1st – Thursday, October 25th. The Waller-Yoblonsky Gallery will be hosting West Fork, showcasing art by current MFA students from Monday, October 14th – Friday, October 19th. Attendees at West Fork on October 16th will also have a chance to view student woodfire pieces in Middle Fork in the Beyond Gallery, the brainchild of MFA candidate and ceramicist, Jon Bashioum. The Beyond Gallery is a mobile gallery intended to promote arts in Montana. Installed in a 1987 MCI Motor Coach, the gallery is currently a work in progress and this show will be the first exhibition in this space after Phase I of renovations. Middle Fork will feature student work based around the theme of wood firing, portraying a respect for tradition and an enthusiasm for innovation. On October 16th, reception for Middle Fork and West Fork will take place from 4:00 – 6:00 pm at the Melvin Graduate Studios, followed by a reception for West Fork from 6:00 – 8:00 pm at the Helen E. Copeland Gallery. Both receptions are free and open to the public. There will also be a variety of woodfire burnings, as well as visiting artists throughout the month. Dan Murphy, Associate Professor from Utah State University, and Julia Isidrez, Studio Artist from Paraguay will be giving ceramic demonstrations in the Ceramics Studio in Haynes Hall on MSU Campus on Thursday, October 11th, 9:00 am – 12:00 pm. Both will be lecturing later that afternoon, at 4:00 pm in Cheever 214. Please visit http://www.hecgallery.com for more details on these events, including artist bios, directions, schedules, and kiln histories. In 1889, Montana became a state. Fifty-six years later, Frances Senska moved the Ceramics program out of Home Economics and under the umbrella of the School of Arts with the assistance of Olga Ross Hannon, from whom Hannon Hall receives its namesake. Seventy-three years later, the School of Arts is proud to host this series of events, celebrating the ceramics program which has been around for more than half of Montana’s history. Many alumni from MSU ceramics have thriving careers, creating everything from functional pottery to contemporary, conceptual works. However, what makes woodfire special is not just the works created, or the history of the department, but the community it inspires. Wood firings take anywhere from one to four days, during which the fire is continually stoked and kept alive by loyal, anticipating craftsman. “Some of my closest friends and fondest college memories come from long days and hours spent prepping for and tending to a wood kiln,” Kronfuss recalls. Woodfiring unto itself is a dance with the heat, a slow burn that brings out the natural tones in the clay, whilst flames lick the muddy surface. There is a stronger element of chance with wood firing as compared with electric or gas kiln firings. One cannot be sure where the work will be singed by the flames, and can only speculate how location in the kiln will impact how the incandescence will incinerate the material. The surface is often rough, but ripe with texture and nuances only available to the keen viewer that takes time investigating the work in the proper light. Woodfiring is a process in which the artists surrenders much of their control to the blaze that they in turn feed and stoke, sometimes heartbroken, sometimes elated by the results. For more information on this exhibition, or on the Helen E. Copeland Gallery and Waller- Yoblonsky Gallery in general, please visit https://hecgallery.com or follow us on Facebook under the Helen E. Copeland Gallery and the Waller-Yoblonsky Gallery. For information on the symposium in Helena, please visit https://www.culturalconfluencewoodfiresymposium.com. The Helen E. Copeland Gallery is located at 213 Haynes Hall on the second floor of Haynes Hall, across from the Aasheim Gate off of 11th, with the Ski Swing out front. Please note that the parking passes are required for parking during the business day (6AM – 6PM). Gallery Hours: Monday – Friday, 9AM – 5PM/Closed on weekends. The Waller-Yoblonsky Gallery at the Melvin Graduate Studios is located at 2998 W Lincoln Street off Garfield Street, east of 19th Street. If coming from 19th, take a right onto Garfield, go ½ mile, and take a left into the Agricultural Experimentation Station. there will be a sign for the Melvin Graduate Studios. Take a right and drive to the last building. Please mind the speed limit and stay beneath 15 MPH once you turn off of Garfield Street. The School of Art at Montana State University is pleased to announce the opening of Giebink’s Cirque d’ Fantastical at the Helen E. Copeland located on the second floor of the School of Art in Haynes Hall, Bozeman, MT. The show will be on exhibit Monday, August 6th– Wednesday, September 25th. A reception will be held on Thursday, September 13th, 6:00 – 8:00 pm and will be free and open to the public. Hors d’oeuvres will be available, as will a cash bar. On view will large-scale wooden sculptures, performances, and video installations by local artist Tom Giebink. Having recently returned to Bozeman, Giebink brings with him a history in film, sculpture, and painting. Beginning on a crew for community television in Austin, Texas in 1976, Giebink has followed the technical advancement of film production and editing. Giebink’s unique approach to the medium, spanning the decades, has pushed film and film editing to its limits. Creating video installations and performances, as in “All Pro Video Rasslin,” Giebink has entertained audiences by manipulating spatial relationships within the camera frame. For example, before CGI made such an endeavor simple, Giebink created anti-gravity rooms, which allowed him to casually walk up walls, and pour water at an impossible angle when viewed through the video frame. Examples of this work will be on view in the gallery. Simultaneously, Giebink has been creating stretched and skewed furniture that refers to the two-dimensional picture plane. Resulting in a strange, yet still functional piece of furniture that is both playful and well crafted, Giebnick reproduces furniture to the exact proportions in a painting: if the legs of a bed are foreshortened in an image, then they are foreshortened in the sculpture. Giebink echoes the aesthetics of Robert Lazzarini, resulting in structures are mystifying. Finally, throughout the exhibition, Giebink will be installing a set in the gallery that incorporates the skewed furniture. Using live feeds and masterful computer knowledge with micro cameras, Giebink will create the set through August and September. This will allow viewers to understand how he manipulates the proportions of a film set to create an overall “anti-gravity” performance space in the gallery. The creation of this set will culminate in live performances in September with collaborator Norah Hajos. We welcome audiences to make frequent trips to the gallery to see how the installation unfolds over two months. For more information on this exhibition, or on the Helen E. Copeland Gallery in general, please visit www.hecgallery.com or follow us on Facebook at facebook.com/msuhecg. The Helen E. Copeland Gallery and the School of Art at Montana State University is pleased to announce the opening of Ghosts: Selections from the PB Davidson Watermark Collection , currently on exhibit currently until Wednesday, July 25th, 2018. On view will be watermarks, old letters, scientific research papers, and historical documents collected by paper chemist, PB Davidson. In 2016, while going through the archives that had not been properly scoured since 1986, HECG Gallery Director, Ella Watson, came across an old cardboard box donning decades of dust, full of files with vague labels such as “States,” and “Animals.” With that, she stepped into the hidden genius of PB Davidson, retired paper chemist and collector. As she spent an afternoon going through watermarks, currency, and old letters, she was stunned by their beauty and historical value. For the next semester, Watson catalogued the 460+ pieces of paper in the PB Davidson Watermark Collection. About 100 of those pieces of paper are on view in the HECG. The title Ghosts, references several aspects of the exhibit from the lost art of letter writing, to the historical documents, to the dying craft of the watermark. Watermarks themselves were a once celebrated art form that are rarely used in everyday transactions, except for currency. However, in their heyday, watermarks were once used as a protection against counterfeit money and documents, as well as personal marks of businesses, countries, and families. PB Davidson himself, was one of those rare types of human being, in whom science and art merge seamlessly. His appreciation of his craft and chemical expertise overlapped with his appreciation for a craft that has since begun to die. In his lifetime, he amassed an amazing collection of historical documents, letters, watermarks, and paper—to the extent that his enthusiasm for the material became public knowledge and associates would send him watermarks of their own. The walls of the front gallery of the HECG are adorned with old currency and letters, heralding back to a time when correspondence was an art, before emails urged us towards brevity and shorthand. There are references to the war effort of WWII and the rationing of paper; the invention of neoprene; and even the eerie solace of knowing that the DMV was just as particular in 1941 as it is today. In glass cases are historical documents: there is an eighteen pence from 1776, printed for New Jersey, while the US was under the rule of King George III; a handwritten letter from 1776 discussing the decision by the Continental Congress to open ports to the international community except those under British Rule; pages from a Mercator Atlas; scientific notes by PB Davidson; confederate money; and a Congressional survey, asking whether or not Hawaii should become a state. There are also walls dedicated to the research of PB Davidson, who while receiving the Industrial Research Fellowship at Mellon Institute of Industrial Research, in Pittsburgh, Pennsylvania, funded by the Strathmore Paper Company in late 1920s, developed much of the watercolor paper that is used today. Finally, suspended like specters of a dying craft, watermarks hang from the ceiling so viewers can gaze at their translucent magnificence. We cordially invite viewers to take time with this collection: come once, come again. Bring your tea and savor a time when the written letter was an art form taught from grade school, before emails and “the cloud” forced us to share our deepest sentiments and memories in bytes and pixels. We urge you to take time with this collection as Dr. Davidson did, and readdress the ephemera of your own life, before your computer crashes and all these important pieces of your own life, your own era, get wiped away, vanish, and become Ghosts. Special thanks to Jane Klockman, daughter of PB Davidson; Kathleen Rabel; and MSU Special Collections, specifically Kim Allen Scott and Heather Hultman, for helping organize this exhibition. The School of Art at Montana State University is pleased to announce the opening of the 2018 Spring BFA Thesis Exhibition at the Helen E. Copeland located on the second floor of the School of Art in Haynes Hall, Bozeman, MT. The show will be on exhibit Wednesday, April 18th through Friday, May 4th, 2018. A reception will be held on Friday, May 4th, 2018 from 6:00-8:00 p.m. and will be free and open to the public. Hors d’oeuvres will be served, as will a cash bar. On view will be the thesis works of 12 emerging artists graduating with their Bachelors Degrees in Fine Art. The following disciplines will be featured in the exhibition: drawing, painting, ceramics, printmaking, sculpture, and metalsmithing. For BFA graduates, the thesis exhibition represents an important transition period from student to working artist. It marks an end to academically assigned work, and the beginning of their individual research and artistic maturity. The exhibited works synthesis the growth of each artist over their years spent at MSU. The following students will be in the exhibition: Jason Baide, Brian Bigelow, Christy Brown, Emily Ferguson, Florence MacDonald, Catherine Schroeder, Kailey Slemp, Alisha Fisher, Kenzie Kvalsten, Alexander Peters, Megan Horner, and James Hogan. The subject matter will be as diverse as the students’ trades, discussing topics such as the archaic methods of cataloging old museums and Wunderkammern, Native identity, endangered species, the victories and loses of war, and anthropomorphism in jewelry. In combination, these students have received grants, taken home places in national competitions around the country, and have had their own solo shows or participated in group shows during their time at Montana State University. This cohort exemplifies some of the best work that the MSU School of Art has to offer and we are personally excited to witness their future endeavors. 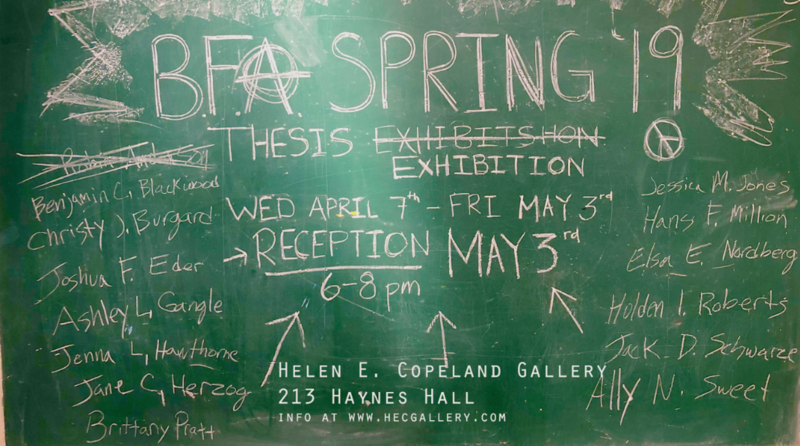 The 2018 Spring BFA Thesis Exhibition will be on view from Wednesday, April 18th – Friday, May 4th, 2018 in the Helen E. Copeland Gallery. The HECG is located on the second floor of Haynes Hall, across from the Aasheim Gate off of 11th, with the Ski Swing out front. Please note that the parking passes are required for parking during the business day (6AM – 6PM). Gallery Hours: Monday – Friday, 9AM – 5PM/Closed on weekends. For more information on this exhibition, The 2018 Spring BFA Thesis Exhibition or on the Helen E. Copeland gallery in general, please visit http://www.hecgallery.com or follow us on Facebook at facebook.com/msuhecg and on Instagram.